Ryan Arabians recently relocated to its new farm in picturesque Brooksville, Florida, about 40 miles north of Tampa. It was founded in 1994 with the halter and Western Pleasure Champion stallion Arobask (Standing Ovaation X Dame Geshenke) and a small band of mares. With the arrival of the pure Polish stallion *Lech PASB (Palas X *Dunkierka) the Ryan Arabians breeding program turned a corner to concentrate on breeding Arabians with pure Polish, or predominantly Polish bloodlines. *Lech is the heart and soul of Ryan Arabians. Experts consider him one of the best-bred Palas sons outside Europe. His dam, *Dunkierka, represents what many believe was the best producing dam line ever created in Poland. *Lech has sired dressage and halter champions and offspring excel in many other disciplines, but his book is now closed to outside mares. 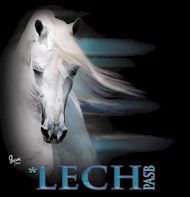 Now Ryan Arabians is proud to offer the services of *Lech's son Lechscaliber. This exciting young stallion earned a Top 3 in the 2006 Region 12 Stallion Sport Horse in Hand Championship, a Top Ten at the 2005 Sport Horse Nationals in the Arabian 2-Year-Old Jackpot Colt competition. 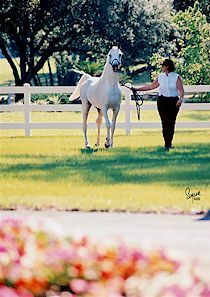 "Cal" was also the 2004 AHAF High Point Champion and Arabian Sport Horse in Hand Champion Stallion at the 2006 AHAF Spring Show in Tampa. Cal is SCID clear and is an AHA Breeders Sweepstakes Nominated Sire. Lechscaliber is now in training with Thel Marquez at Demaraz Farms Arabians at the Daytona Beach Training Center. For more information call Demaraz at 386-788-7818. Nancy Ryan has been a dedicated horse owner and competitive equestrienne since her earliest childhood. Although her early experience in Connecticut centered on Thoroughbreds, Nancy always harbored a love for Arabians, and plans to cultivate that love well into the future. Alan Ryan is an experienced horseman as well and handles the day-to-day management of the farm. The Ryans have three sons - Trevor, Geoffrey and Christopher.